Each month, her classroom has a different theme. The month of October was dedicated to all things Fall, and they had a special week devoted to pumpkins — pumpkin crafts, pumpkin songs, pumpkin decorating, and pumpkin snacks! The teachers asked for parent volunteers to make a couple pumpkin-based foods for the kiddos to try, and I signed up for pumpkin butter. If you haven’t had it before, pumpkin butter doesn’t actually contain butter, but it has a thick, creamy, butter-like consistency. It’s made of pumpkin puree, sugar, apple juice, and spices, all cooked slowly over low heat until thickened and delicious. The flavor is heavenly — it tastes a lot like pumpkin pie, with a wonderful balance of pumpkin flavor, subtle sweetness, and warm autumn spices. There are many ways you can serve pumpkin butter — you can stir it into yogurt, dollop it on pancakes, heat it and serve it over vanilla ice cream, mix it with cream cheese + spread on a bagel — but my favorite way to serve it is very simply, spread onto fresh-outta-the-oven biscuits. Mmmmm. However you serve it, I think you are going to love this simple, scrumptious fall treat! Combine all ingredients — pumpkin, apple juice, spices, and sugar — in a large saucepan; stir well. Bring mixture to a boil. Reduce heat to a simmer, and cook for 30-40 minutes or until thickened, stirring frequently. I love pumpkin butter! It’s so delicious. It’s great that the school is introducing kids to different foods. awww, preschool! how fun this pumpkin butter looks delicious. i’m sure it was a hit! She started preschool! I can not believe how fearlessly the time flies. Wow. Your Pumpkin Butter sounds great. It’s that time of year! 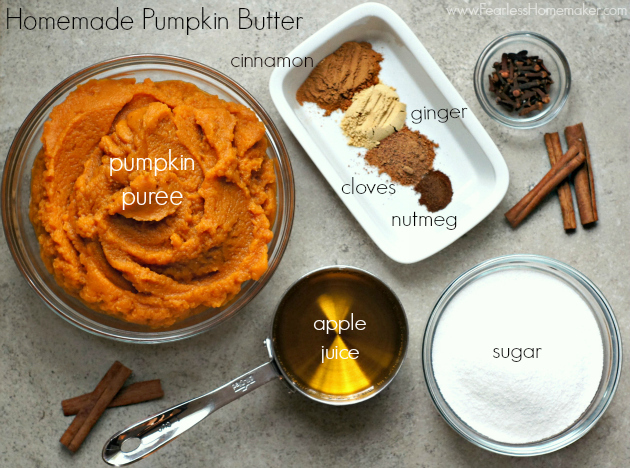 I’ve not heard of pumpkin butter but is sounds like I need to try it…it sounds great. Oh wow! 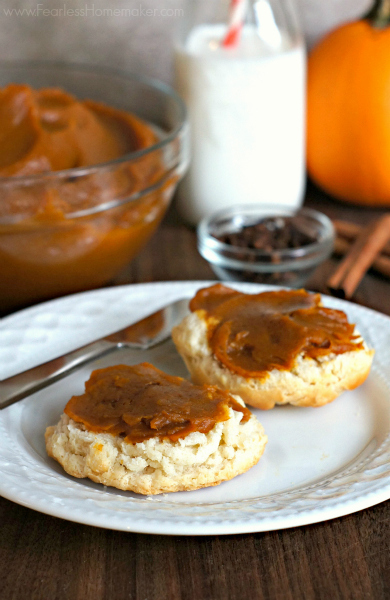 This pumpkin butter is pure genius. Love it. Can’t wait to try.! YUM! I love pumpkin butter and somehow I’ve never made it before. Must try your recipe soon!